If you are a hitter choosing which bat to buy is a crucial decision. But finding the best fastpitch softball bat is not an easy task. The selection of bats is huge, there are so many brands, models, styles. How to determine which one will be perfect for you? There are many different aspects to think about. It is important to choose a bat that will help you get the most out of your game. We have tried to come up with a guide that will help you make the best choice. Moreover, there are new models popping up every year, promising new and revolutionary improvements and innovations in design created to help you up your game. But does any of it actually make sense, or is it all just a marketing talk? We have gone through all the testing, reviews and players’ experiences and created a list of the most popular fastpitch bats of the season. We have also reviewed the most popular softball cleats to help you in search for the best softball cleats for you. Please note that we have tried to be as unbiased as possible, but the reviews are somewhat reflection of our personal opinions. If you have any feedback, we would like to hear from you. This is without a doubt the most talked-about fastpitch bat of the 2018 season. The fully composite two piece design is getting a lot of attention for its Double Barrel design, currently in the process of being patented. The extremely low compression outer barrel is combined with a high performing inner barrel creating the ultimate combination of feel, performance and sound. Â Be aware that the current model of the Easton Ghost bat is not approved for USSSA, however Easton will be releasing a USSSA model of the Easton Ghost Double Barrel. We do not know yet when it will be released. Louisville Slugger PXT is the newest addition to the legendary fastpitch line-up that Louisville Slugger come out with every year. The new barrel design is aimed towards elite players that can generate enough bat speed to get the most out of it. This bat is perfect for power hitter, as itâs got an amazing pop. The downside is that it is not hot out of the wrapper and it requires a significant amount of break in to get it game ready. DeMarini has had the CF series for a decade, so the latest one is the CFX. This is one of the most balanced bats currently available, and it will certainly be the most popular one in the DeMarini lineup. It features the 3Fusion Technology System, from knob to endcap. The new system builds off the multi-piece bat by adding a third element via the bat’s taper. The 3Fusion End Cap optimizes bat weight control and performance, and the 3Fusion Handle is made with a new streamlined design for ultimate feel, while reducing vibration and redirecting energy back into the barrel. The bat is hot off the wrapper, and has a nice pop. It has the largest sweet spot and less vibration through contact in the current lineup of Louisville Slugger Bats. The difference from the last yearâs model is the X-Cap design that gives you improved swing speed and better durability. However, according to some reviews of those who have used it for some time, it tends to lose the pop. This is still a great bat though, and with its Patented TRU3TM technology that allows for independent movement between the barrel and the handle, itâs ideal for contact hitters looking to get on base with hard hits. A key to finding a faspitch bat that is perfect for you is to get the size and weight that fits you. When choosing the softball bat that is right for you, you need to know how to measure it properly. The length is measured from the knob to the barrel. Place the knob at the center of your chest and extend the barrel out toward your fingertips. If you can touch the end of the bat with your fingertips, the bat is an appropriate size. Another way it to measure from the center of your chest to the tips of your index finger, with your arm straight out to your side. The approximate length of the bat you need according to the height and weight is shown in the chart below. When it comes to the weight, you should go with a weight that you are comfortable swinging. Many beginners or parents of young players tend to choose bat that is too heavy. If you can’t hold the bat with one hand, with your arm extended to your side, for 30 seconds without struggle, the bat is probably too heavy for you. The drop is the number that represents difference between the length and weight of the bat. A lower drop usually indicates a heavier bat. The fastpitch softball bats usually have a drop ranging from -8 to -13. Don’t let this number confuse you: it is merely a indicator of weight to length ratio of your bat. Barrel is the top part of the softball bat and it’s defined by its diameter and length. Handle is the bottom part of the bat that the player grasps. The diameter of the handle is called the taper. Construction: Depending on the way they are constructed fast pitch bats can be one-piece or two-piece. A one-piece bat is developed as one continuous piece, while at two-piece bat the barrel and the handle are separate sections, which are bonded together. One-piece bats provide little or no give and have a stiff feel when contact is made with the ball. They have a very minimal amount of flex at contact, so little energy is lost on impact which results in more power. This type of bats is great for power hitters. Two-piece bats provide more flex at contact with the ball and create a âwhipâ effect that results in increase in bat speed during swing. Two-piece bats are fitting for the contact hitters. The two main parts of any softball bat are the handle and the barrel. Other parts are the knob, grip and end cap. SPEED: Bat speed is very important for softball hitters, especially in fastpitch. In softball today, the pitchers are getting bigger, stronger and faster, the players have to either get faster or make their swing shorter. Players with faster bats can wait longer to see the ball better, which allows them to make better decisions. By increasing their bat speed, players will improve their mechanics, hand-eye coordination and will be able to hit for greater distances. When choosing the best fastpitch bat for you make sure to pick one that will allow you to get the maximum out of your bat speed. PERFORMANCE: Intuitively, you would want to go for a bat that has the best performance possible. However, it is not that simple. A new requirements announced in 2011 introduced a new regulation parameter called BPF – bat performance factor. This does not limit the speed of the ball upon hit, but the increase in the liveliness of a ball hitting a bat compared to throwing a ball against a solid wall. According to current regulations bats may not exceed a BPF of 1.20. So when shopping for softball bat make sure to check whether it has a BPF stamp, to confirm it is legal for play. MATERIAL: According to the material they are made of softball bats can be aluminum, or alloy bats, composite and hybrid bats also called half-and-half. Wooden bats are mostly abandoned in competitive fastpitch softball. Composite bats are made of mix of graphite, fiberglass and plastic resin, which gives them a distinctive sound. Composite bats are durable, superior in performance, have a larger sweet spot, but they also tend to crack and they can’t be used in very cold weather. They are also the most expensive version of softball bats, so they are used mainly by players on a higher level. Aluminum bats are traditional, less expensive, they give a “stiffer” feel and, in theory, they can lose their pop over time. They are used by the players that prefer a sturdy, lightweight bats. Hybrid bats are created from the idea to give players the best of the both worlds. They are made in a way to include both aluminum and elements made of composite materials. Every manufacturer behind hybrid models have their own reason and way of crafting the bat they claim has the optimal performance. The most traditional hybrid bat is a composite handle and aluminum barrel, but there are many different variations. 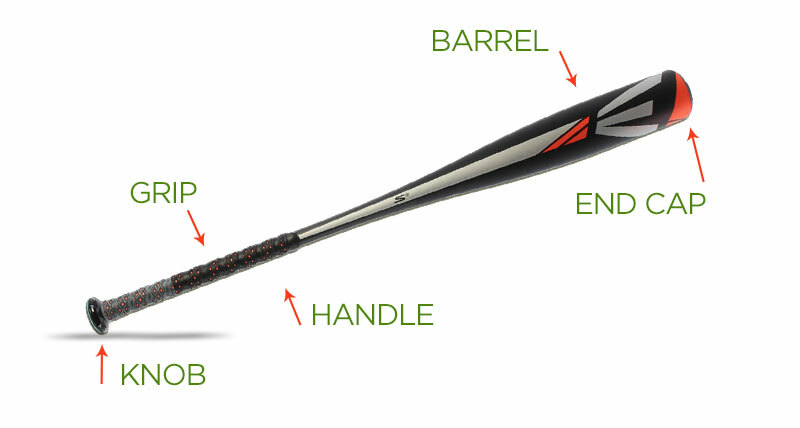 COMFORT: The handle has a great role in how comfortably you can hit. The handle is defined by its thickness and grip. Having a firm grip is important, for safety as well as optimal hitting. A softball is much larger than a baseball, so it the chance for uncomfortable hand vibrations is greatly increased. A thicker handle reduces this vibrations, but it weighs more and can slow down the bat speed. Bats with a smaller drop (-9, -8), or smaller length to weight ratio, are generally considered end loaded bats. The weight is distributed more towards the end of the bat, making it a bit heavier to swing. Many players tend to choose a balanced, lighter bat, because they think they will be able to swing better. But that doesnât always have to be the case. However, end loaded softball bats for fastpitch can have many advantages. Sometimes two bats with the same actual weight might feel different when they are swung. This has to do with the distribution of weight. The âswing weightâ is defined by something called moment of inertia, which depends both on the total weight and the balance point. The end loaded bats are initially harder to swing and control, but give much more power on impact, sending the ball further. The bat with weight distributed towards the end of the barrel may not be good for the beginners that do not have developed strength and quick swing speed. For stronger power hitters this type of bat has many advantages. The âtop heavyâ bats require refined hitting skills because if you hit the ball just right, it goes a long way, if you don’t hit it perfect, you foul it off or pop it up. If you are tall and strong the end load will help you keep your speed up on impact. After contact speed can actually increase using an end loaded bat, or at least stay the same and not decrease as much as balanced does because of the weight distribution keeps the inertia. Youth fastpitch players need lighter swing weight so they can achieve more power at the plate. For them the balanced bat might be the best solution. But if a young player is strong and athletic enough to control the speed, then the extra power can translate into another 10 to 30 feet or more to the ball distance. Have in mind that regulations are different form one league to another and you should check them before making a purchase, since USSSA bats may not be allowed in ASA play, and vice-versa. There are bats that have dual stamp and those are allowed in leagues of both associations. Finally, you should know that choosing the right fast pitch bat is very individual. Ray Demarini used to say that for a softball player the perfect bat weight was 28oz. That may be right, but the real truth is that the perfect bat is the one you feel most comfortable with and you can use for a long time. You can browse though our selection of best fastpitch softball bats and read the reviews to help you with your choice. Get together with friends and place your orders at the same time and ship to the same place. You can get free shipping, and sometimes you will all get a discount as well. Technology of softball bats is constantly advancing. The world’s leading brands produce new bats or improve their old models using the latest technology. There are several big brands you need to take into consideration when choosing fastpitch bat for the season. The hottest fastpitch softball bat of last year was the Easton Mako. Coming in two versions as a end-loaded “Easton Mako -9” and evenly balanced “Mako -10” and “Mako -11”. Trying to match the success of its predecessors the newly released Easton Mako Torq, a composite two-piece bat with high-end performance abilities. Louisville Slugger bats are made by Hillerich & Bradsby Company with a great tradition of over 120 years. The most famous fastpitch bat is the Louisville Slugger Xeno, and advertised as one of the most powerful ones is Louisville Slugger LXT. In early deays, Demarini was virtually unknown in the world of softball equipment. But they grew steadily and now they are the manufactures of some of the great fastpitch softball bats: Demarini CF8 and Demarini Vendetta. Miken softball bats are all about latest technology and performance. Miken freak is a fully composite, two-piece fastpitch bat with a big sweet spot and great performance. Worth fastpitch bats are legendary in the history of softball used in Women’s College World Series. Worth 2 Legit is the latest fastpitch softball bat manufactured by this company. All About Fastpitch gives you information about the hottest softball equipment and the best fastpitch softball bats reviews.